The patient is a gentleman from out of state who had called about problems he was having with walking and with leg ulcers that wouldn’t heal. He is in his seventies and has a pacemaker for an arrhythmia for which he was on Xarelto. He also had type II diabetes. He had bilateral lower extremity deep venous thromboses 6 years prior requiring IVC filter placement. The filter occluded, and it resulted in sudden sharp and debilitating pain in both legs with walking short distances -some days only 50 paces.He described it as an unbearable pain in calves and thighs that felt like his legs were going to burst. He also had ulcers on his legs that would heal with ministration but soon recur. This was all despite being quite active, with regular workouts, and being fit. He was compliant with compression. He sent a CT scan done last year (below). It showed an Optease retrievable vena cava filter that was occluded and the iliac systems bilaterally (right above and left below) were chronically occluded with patent vena cava above and femoral confluences bilaterally below. He had no hypercoagulability nor ongoing recent DVT’s. I thought there was a good chance that we would be able to recanalize the occluded iliocaval segment and he flew in for a consultation, and he was pencilled into the schedule ahead of his visit. Examination revealed a fit and trim man in his 70’s in no apparent distress. He had bilateral leg edema that was moderate with small superficial and tender ulcers of the right posterior distal calf. Pulses were normal. He was taken to our hybrid suite and venography from femoral vein access in the proximal thigh in the supine position revealed his right and left iliac venous systems to be occluded (below figures). Wire access into the iliac systems was performed with Glidewire and Glidecatheter periodic venography to confirm that I had not exited the vein. Unlike the arterial system, extravasation from being extravenous does not have the consequence of bleeding, hematoma development, and pseudoaneurysm formation because of the low pressure, but it can be a long procedure and uncomfortable as well so these are done under general anesthesia. Once position confirmed to be in the iliac vein, the vein was dilated to allow for greater ease of movement. In the case of the uncrossable filter, I switched to access from above via a right internal jugular vein access. Once the wire crossed into the iliac vein from above, it was captured and brought out. While ballooning by itself is inadequate for revascularization, it greatly eases wire capture and on the right, it was done simply by driving the wire from above into the sheath. Wire capture wins access across the iliocaval and IVC filter occlusion from below. Once wire access is done, ballooning across the filter is done from both sides. A large sheath is them delivered across the IVC filter. Finally, a Palmaz stent mounted on a large balloon is delivered and deployed. I chose to do this from the right access, and retracted the wire on the left -something done with some trepidation because of the great difficulty gaining this access, but with with prior balloon dilatation, reaccess is made easier. Also, plan B would be reaccess from above. When this is accomplished, the left sided wire is reaccessed across this stent. This is the venous side analogue to gate access in EVAR (below). Once this is done, the iliac veins are dilated to 14mm from the IVC to the common femoral arteries. large 18mm Wall stents are deployed in a kissing fashion from the caval stent into both iliac systems and dilated to 18mm. After deployment, the Wall Stents are ballooned to 18mm. These stents were extended into the common femoral artery with 14mm nitinol stents. Completion venography suggested successful iliocaval recanalization and revascularization but these procedures are not done without a final intravascular ultrasound (IVUS). Looks done, but needed final intervention after IVUS. Intravascular ultrasound revealed incomplete expansion of the right common femoral stent. This was treated with another stent and ballooning with the result on the right. Venography alone is insufficient in determining patency. As illustrated, IVUS ensures a durable outcome. The leg ulcer was treated with an Unna’s boot. A word about the venerable Unna’s boot –it works. The dressing dries and compresses while the Zinc Oxide prevents bacterial growth. It is interesting that the dressing is so infrequently used nowadays but not so when you consider that it isn’t reimbursed. And patients generally hate it. This revascularization has an excellent chance at working as the patient has no hypercoagulability and had a patent common femoral confluence bilaterally. As I had mentioned in a prior post, the idea in venous revascularization is connecting confluences that serve as inflow and outflow. This will require followup, consisting of duplex, and it is advantageous that he is anticoagulated for his arrhythmia. It is becoming more apparent that those languishing with chronic venous insufficiency and its complications need the IVC and iliac veins interrogated with a duplex. When an obstruction is found, they should be treated with these techniques as a first line therapy. The patient is a young father in his early thirties who complains of severe headaches, dyspnea, and inability to function or interact with his toddler. He complains of visual disturbancers when bending over and has dilated neck veins when recumbent. He was born with aortic stenosis and has undergone three aortic valve replacements and has had pacemakers since childhood. His most current pacemaker is a DDDR pacemaker in his left subclavian venous position, but he has two dead leads in his right subclavian vein. His symptoms started in his twenties but has worsened sharply over the past year. An effort was made to remove his dead leads at a tertiary referral center, but they couldn’t. On examination, he had significant findings from dilated neck and supraclavicular fossa veins, a left chest pacemaker, and scars from his sternotomies. Duplex showed a patent bilateral internal jugular veins (IJV) with minimal respirophasic variability. Venography (composite, above) showed superior vena cava occlusion consistent with his diagnosis of SVC Syndrome. I measured venous pressures, which we normally don’t do, because I was curious about them. Right IJ access with ultrasound with a sheath revealed pressures on the monitor in CVP mode of 22mmHg. Access from the groin into the heart revealed a right atrial (RA) pressure of 14mmHg. The SVC was crossed from below into the right IJV, and the SVC was dilated with a balloon -no stenting was possible because of the presence of the leads. His pacemaker did not fail during the procedure. After balloon dilatation, contrast passed easily from his IJV into his RA (below). His pressure in the R. IJV was 17mmHg and in the RA was 16mmHg. He immediately felt relief and in 1 month followup had sustained symptom relief with patent flows seen in right IJV. He understood it was likely he would need regular reintervention when symptoms returned. While IVUS is usually the way to check on patency after venous intervention, the presence of permanent pacemaker leads, including a set of nonfunctioning leads from the right SCV, made its use moot -venoplasty to 12mm was done in multiple stations and there was to be no stenting which is the usual next step if IVUS found residual stenosis. The more interesting finding here is the pressures measured in the IJV. The symptoms of SVC syndrome come from venous hypertension, but we rarely if ever measure pressure. Intracranial pressure (ICP) which is used to monitor for critical hypertension in the cranium typically after surgery or trauma, is considered high if over 15mmHg, moderately elevated over 20mmHg, and severe when over 40mmHg. ICP is greater than or equal to intracranial venous pressure, and in patients with SVC occlusion, this pressure is equal to the IJV pressure. With an IJV pressure of 22, this patient’s ICP was likely over 20mmHg, explaining his incapacitation. IJV pressure is easily obtained and may justify urgent intervention in acute SVC syndrome, although more data needs to be obtained. This patient will benefit most from a more durable solution, but for now, he is very pleased to be able to take part in the care of his young child. POTS+May-Thurner’s Syndrome: Rare Disease Causes Rare Disease? The patient is a younger man in his twenties who began having dizzy spells associated with near syncope and tunnel vision. He was previously an athlete and was fit and never had such episodes -he had a resting heart rate typically in the 60’s or lower. Workup for arrhythmias was ultimately positive for POTS -postural orthostatic tachycardia syndrome and he was referred to Dr. Fredrick Jaeger of our Syncope Clinic. Tilt table testing the demonstrated the reported tachycardia over 140bpm while upright rising from 60bpm while supine. A radionuclide hemodynamic study (Syncope Radionuclide Hemodynamic Test) showed 54% of his blood volume pooled in his left lower extremity and lower abdomen with upright posture. Air plethysmography (PHLEBOTEST) showed abnormal refill and fill times in both legs and a duplex of the legs showed deep venous reflux in both legs. MRV revealed narrowing of left common iliac vein by the overlying right common iliac artery (May-Thurner’s Syndrome, MTS), and this was where the patient came to my clinic. The MRV, shown above and below showed the typical pathoanatomy for MTS, but the patient had no symptoms related to left leg swelling, DVT, or varicosities. He did have a reducible left inguinal hernia which was quite tender. After some deliberation, while not promising anything regarding his POTS, I agreed to proceed with treating his pathoanatomy. Discussion with Dr. Jaeger revealed this: normally about 20% of blood volume parks in the legs with standing which is rapidly dissipated with normal calf muscle pump action. In a subset of patients with POTS, there is a 30-40% maldistribution of blood volume into the legs which may or may not drive the autonomic responses leading to POTS. He has never seen a study result showing a 54% distribution. It made physiologic and anatomic sense to me to proceed with a venogram and intervention, but I confess I was dubious about any affects I might have on the patient’s POTS and I informed him of it. Also, I recommended seeing a general surgeon for his hernia. Venography showed obstruction of his left common iliac vein as evidenced by the filling of pelvic and lumbar collateral veins. 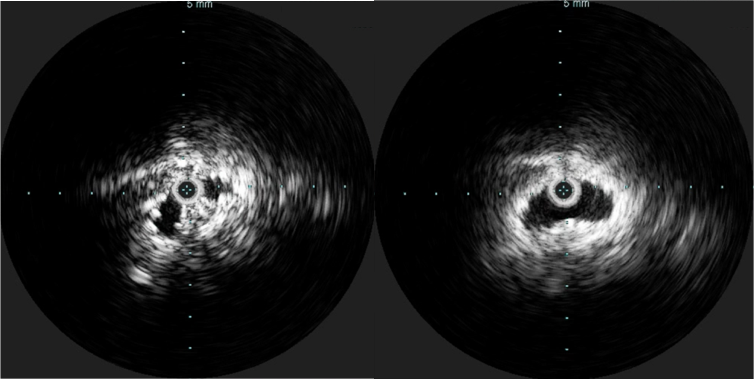 Intravascular ultrasound showed the narrowing better and more directly (panel below). The right common iliac artery narrowed the left common iliac vein severely. A 22mm Wall Stent was positioned across this and dilated with a 22mm balloon in the IVC and an 18mm balloon in the iliac vein. The resulting venogram showed resolution of the obstruction with collateral veins no longer visualized (below). But again, IVUS demonstrated more directly the result (and illustrates the importance of having IVUS available for venous interventions). The patient was discharged after procedure on a baby aspirin only. He subsequently underwent laparoscopic inguinal herniorrhaphy and returned to my clinic about a month later. 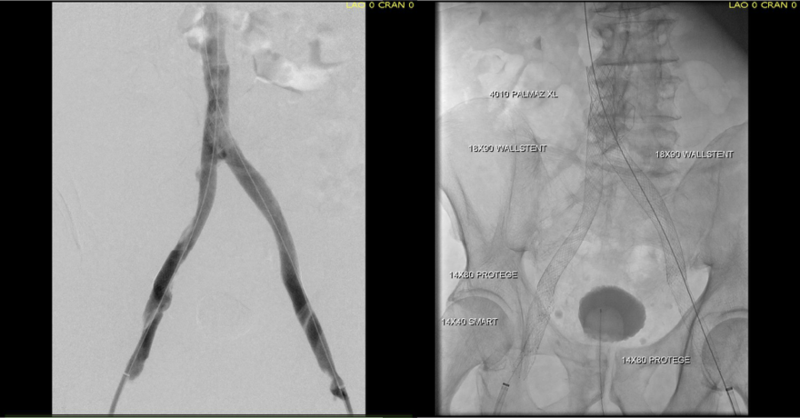 His followup duplex showed a widely patent stent and normal flows in the left iliac venous system. Surprisingly -the patient declared that he was cured of his POTS. He said since the stents went in, he has not had any more episodes of near syncope, dizziness, tunnel vision, nor weakness requiring lying down to rest. His wife confirmed that he was a flurry of activity over the holidays that was surprising considering how debilitated he was before. This is astonishing to me. But it should not be a surprise given this: if the POTS symptoms were the result of autonomic dysregulation, a breakdown of the feedback control loop, there were only several places this could be a problem. The pathology, the MTS, explains the POTS in this instance very nicely. Because the problem was in the cardiovascular system part of the diagram which I can fix and not the autonomic nervous system control element, which I can’t fix yet, a solution could be tried. This was not an asymptomatic compression of the iliac vein which we do encounter as an incidental finding. It seems to be POTS caused by MTS, and cured for now by treatment of the MTS. The patient is a young woman who three weeks prior to presentation developed sudden low back pain and left leg pain while exercising on an elliptical. This pain worsened through the subsequent weeks and she developed fevers, chills, and night sweats, and she came to the emergency department. There, she was found to have left thigh and leg swelling. Duplex revealed a left iliofemoral DVT starting from the iliocaval tributary and extending to her left femoral vein (figure above). A CT scan revealed a pulmonary embolism to the left lung (below). No precipitating factors were present. Vascular surgery was consulted. Plan was for catheter directed thrombolysis. Venography from the patient’s popliteal vein via a short saphenous access revealed thrombotic occlusion from the left common femoral confluence to the iliocaval confluence. The thrombus was crossed, and ballooning showed there was chronicity to the occlusion in the pelvis evidenced by waisting of the balloon on inflation. A multihole infusion catheter was placed across the thrombus from the thigh to the inferior vena cava and recombinant tissue plasminogen activator was infused overnight. The venogram from the popliteal vein showed a patent popliteal and femoral vein and the goal of this procedure became opening the common femoral vein and its confluence of multiple veins from the thigh, to connect it via stents to the vena cava (second image below). Clinically, there was no change overnight and when the patient was restudied next morning, there was still an occlusion starting at the common femoral vein. At this point, I had a choice as to what to do next. First, I could stop, and have the patient start anticoagulation and return several months later -often, the common femoral vein returns to drain into pelvic collaterals. As I had discussed in an earlier post, venous interventions are no different from arterial ones in that inflow, draining vein, and outflow have to be considered. In the case of the veins, I like to think of it as connecting major confluences, and for a leg, the common femoral venous confluence is paramount. Intervening from the popliteal vein to the vena cava is inferior to being able to connect draining veins at the common femoral confluence to the vena cava. So getting the common femoral vein to patency is critical, and can sometimes be achieved with anticoagulation and time. The second option is to break out a thrombectomy catheter and try to remove the thrombus by various machinations, ie. gadgets and novel catheter systems of which there are many. I felt that given the three week time course of the thrombus, the best we could get was some clearance of thrombus, leaving behind a complex network of chronic thrombus and fibrinous scar with the overnight lysis. I didn’t even try this second option and the thrombectomy machine stayed unplugged, the fancy (and expensive) catheters left hanging. The third option, surgery, was not indicated as the patient did not have signs of phlegmasia, and for the same reasons that the lysis didn’t work, opening the common femoral vein for an endovenectomy has uneven outcomes. The fourth option, mechanical aspiration sheath thrombectomy (MAST), is a technique developed by Dan Clair, our former chair. As a concept, it is very simple. A large sheath (>12F) is introduced and the thrombus is aspirated while the bare sheath is advanced over a wire. The sheath is then removed and the contents emptied. For this case, an 18 F sheath was introduced into the femoral vein in mid thigh. The blood is ejected into a basin and a cell saver (in non-malignant cases) is used to salvage the whole blood. This reopened the common femoral vein. This was for me a very important step as without achieving this, I would have had to stent into the femoral vein, excluding many smaller veins draining into the common femoral vein, and effectively basing my revascularization off the popliteal vein confluence, an inferior inflow source for venous revascularization. With the common femoral vein open, placing stents from the vena cava to the common femoral vein was straightforward and described elsewhere (reference). The iliac vein remained closed due to the chronic thrombosis, which was clinically May Thurner’s Syndrome, and was stented. Three things deserve comment: the vena cava and iliac veins need to be dilated up to 18mm, and larger for the cava. This is disconcerting, but size does matter. Second, IVUS is critical in confirming that everything is open. Third, the 14mm nitinol stent placed into the common femoral vein will stay open, unlike a stent placed into the artery across the inguinal ligament. It likely has to do with the deeper position of the vein in relation to the artery which protects the vein from the ligament. We don’t have the large diameter nitinol stents designed for iliocaval venous revascularization yet, but the available stents do a good job. The patient was discharged on anticoagulation with resolving edema in the left leg and thigh. At one month followup, duplex confirmed wide patency of the stents and IVC and no new DVT. Discussion: MAST illustrates a critical issue for all innovation in the current setting of resource limitation. Innovations must be made with not just a consideration to efficacy and potential market, but also cost. The large sheaths used in MAST are commonly available and cheaper by multiples of tens compared to the thrombectomy systems and catheters. Unpublished data reviewing 13 patients undergoing MAST with a mean followup showed 69% with complete thrombus removal, 31% with subsegmental removal, no operative mortality, and 92% primary patency at an average of 79 days of followup, all with symptom improvement (Clair, correspondence). Other groups have reported similiar results using “large catheters” (reference 2), but nothing can compare to an 18F sheath in clearing the iliocaval system. The patient can expect to have excellent patency in the short to mid term (reference 1). Titus JM et al. J Vasc Surg. 2011 Mar;53(3):706-12. Patient is a middle aged man with history of DVT and PE who in preoperative workup for another operation was found to have a popliteal venous aneurysm affecting his right leg. Unlike the recently posted case (link) which was fusiform, this aneurysm was saccular (CT above, duplex below). Popliteal venous aneurysms have a high risk of pulmonary embolism because: they tend to form clot in areas of sluggish flow and once loaded with clot, will eject it when compressed during knee flexion. When I perform open vascular surgery, I tend to get a CTA not just because it is minimally invasive and convenient, but because it gives important information for operative planning. The volume rendering function, which takes the 3 dimensional data set from a spiral CT scan, and creates voxels (3 dimensional pixels) of density information and creates stunning images such as the one featured on the current September 2016 issue of the Journal of Vascular Surgery. But these are not just pretty pictures. In fact, I use these images to plan open surgery, even to the location of incisions. Vital structures are seen in 3D and injuries are avoided. Take for example the CT Venogram on the panel below. By adjusting the window level, you have first the venographic information showing the saccular popliteal venous aneurysm on the left panel, you can also see where it is in reference to the muscles in the popliteal fossa. The greater saphenous vein and varicose veins below are well seen. By adjusting the level, subcutaneous structures are better seen including the small saphenous vein which could be harvested to create a patch or a panel graft from a posterior approach. A final adjustment of the window level on the right shows the skin, and I can now plan the curvilinear incision. By changing the orientation, I can also recreate the surgeon’s eye view of the leg in the prone position (below). This was treated with plication of the saccular aneurysm and unlike the fusiform aneurysm, I did not sew over a mandrill (a large 24F foley) inserted through a transverse venotomy, but rather ran a Blalock type stitch under and over a clamp. The several weeks postoperatively showed no further trace of the saccular aneurysm. The volume rendering software grew out of the 3D gaming industry. The voxel data that paints flesh and bone on skeletons and costumes and weapons is far more complex than what is applied for the 3DVR packages that are available. The images shown for this post comes from TeraRecon/Aquarius, but they are also available as open source software from Osirix, Vitrea, and various software packages sold with CT scanners. While those that are tied to the scanners are often tied to dedicated workstations -limiting you to going to Radiology and taking over their workstation, many will work in the cloud for both the DICOM data and for virtual desktop access through mobile. Contrast is not necessary if the patient has kidney dysfunction -the vessels can be manually centerlined -ie. a line can be dropped in the center of the artery to illustrate its course when viewing the VR images. I will plan the surgery while in the clinic with the patient, actually tracing out the incisions and dissections necessary to achieve success. It is a wonderful teaching tool for trainees. But most critically, it helps me imagine the operation and its successful completion.